Miners in Burma -or Myanmar- were looking for rare gems when they discovered something unexpected: A 4.3-metres high, 5.8-metres long, and 210-tonnes heavy jade stone, which is worth some $170 million. 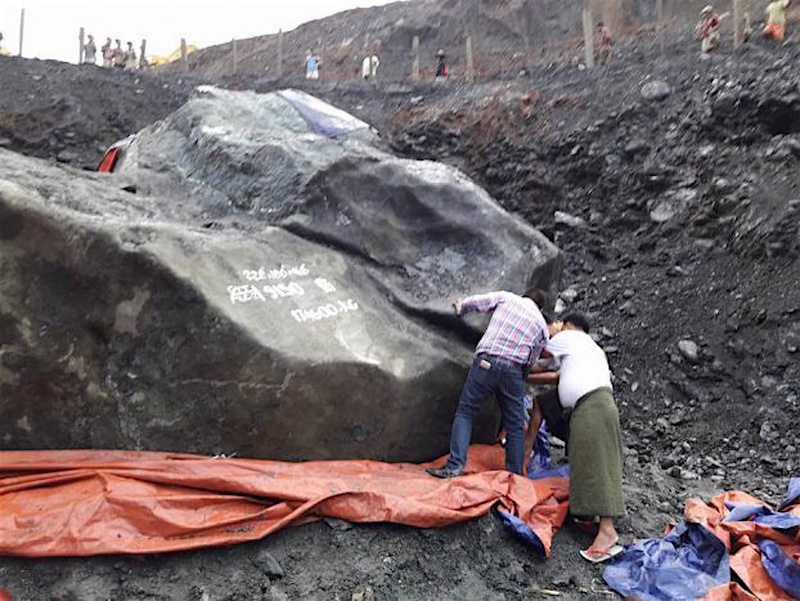 The giant rock appeared in the northern Kachin state, at a site operated by the Yadanar Taungtan Company in a joint-venture with the Ministry of Mining. The boulder will be sent off to China to be carved into jewellery and sculptures. The Southeast Asian country’s +$31 billion jade industry is the source of nearly all of the world’s finest greenstone and it’s a magnet for foreign capital, with China being its number one buyer. Nearly half Burma’s GDP comes from jade mining. “It is a present for the fate for our citizens, the government and our party as it was discovered in the time of our government. It's a very good sign for us,” local politician U Tint Soe is quoted saying by The Independent. Despite the current optimistic atmosphere, jade mining has a dark history in the area. According to Global Witness, the industry has been operated under secretive “standards” by networks of military elites, drug lords, and crooked companies and it has been is fuelling armed conflict and land expropriation. The poorly regulated nature of jade production in Burma is also the cause of numerous deadly accidents, most of which go unreported.